The sun smiles overhead at birds following a little boat on a big sea. This big blue wave, small boat themed print is a metaphor for life. Push ahead and survive, that's the message. 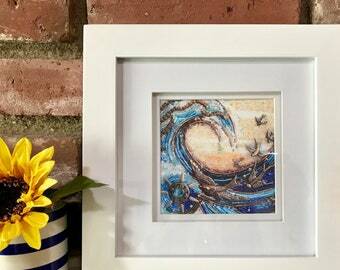 Show them you have what it takes, with a print of Diana Maus’s beaded mosaic art, Lean In. Gold and silver embellishments, Swarovski crystals, silver birds, and a silver boat on a swirling wave. This print is embellished with handpainted gold details. 8” x 8” framed, digital print on enhanced matte paper in gold-toned metal frame with chain. 8” x 10 1/2” including chain when hung. Ready to hang.